This program is concluded, for more resources visit Hand Hygiene. Reducing the spread of germs in hospitals, and the number of serious infections among patients is vital for improving patient safety. Hand decontamination has been shown to prevent the spread of infectious agents in clinical setting for over 150 years. An Expert Group was established by the NSW Minister for Health in June 2005, to advise on all aspects of preventing and controlling infections. This group identified the need to improve hand hygiene among all healthcare workers. Good hand hygiene means cleaning using either alcohol-based hand rub or soap-and-water to help stop the spread of germs. By stopping the spread of germs we can reduce infections among patients. The Clean Hands Save Lives campaign aims to reduce the spread of serious germs, including healthcare associated infections, by increasing good hand hygiene among hospital staff, patients and visitors. Healthcare associated infections include those caused by germs known as Multiple Antibiotic Resistant Bacteria (MROs). Health care associated infections (HAIs), particularly those involving multiresistant organisms (MROs) pose a very real and serious threat to people who are admitted to hospital, however many of these infections are preventable. Microbes can be readily transmitted on health care workers' hands, and hand hygiene substantially reduces this transmission. International evidence agrees that there is no single way of reducing healthcare associated infections (HAIs) but improving hand hygiene compliance can have a significant impact. The Clean Hands Save Lives Campaign is designed to improve hand hygiene and reduce health care associated infections in NSW. The campaign was launched on 27th March 2006 and will run for 12 months. User-friendly materials designed to encourage patients to become involved in their own healthcare. Brochures are available in 22 languages. A key message of the campaign targets patients and consumers of health care, telling them "It's OK to ask" health professionals if they have cleaned their hands. NB: This program is concluded, for more resources visit Hand Hygiene. Download A4 PDFs of the Clean Hands Save Lives Talking Wall posters below. Got a spare 20 seconds to save a life? Getting into a lather at work? What's the secret to reducing infections in hospitals? This document is intended to be a guide to implementing the Hand Hygiene Campaign for NSW Health. It has been designed to allow for some adaptation by the Area Health Service Hand Hygiene Project Officers to reflect local circumstances. Australia committed to address health care associated infections. On 10 November 2006, Australia pledged their commitment to address healthcare associated infections through actions such as promoting understanding of the importance of improving hand hygiene among health care providers. 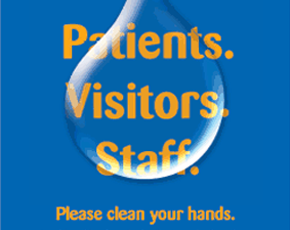 During 2006 - 2007 the Clinical Excellence Commission in partnership with the NSW Health Department conducted a statewide campaign to improve compliance with hand hygiene. By way of identifying the current status of hand hygiene practices in NSW in comparison to the Clean Hands Save Lives Campaign Hand Hygiene Compliance data conducted in New South Wales between February 2006 and February 2007, The Clinical Excellence Commission requested each Area Health Service to conduct Hand Hygiene Compliance Audits in July 2008.